The Swedish Energy Agency has tested wood-fired boilers for small houses. The best efficiency in the test, 93%, was by Värmebaronen’s Swedish made Vedolux 350. All wood-fired boilers are environmentally approved. A clean and easy to sweep wood-fired boiler saves a lot of time and money. All of Värmebaronen’s wood-fired boilers are tested with excellent efficiency, but the most important thing is that they are easy to sweep. Soot and deposits otherwise mean that the heat escapes up the chimney rather than staying in the boiler where it is beneficial. Economy sweeping only takes a few minutes, so you can do it as often as you like. It uses less wood and you save hours at the log pile! Always check how sweeping works when you select a wood-fired boiler! An easy care boiler is easy on the back and knees, gives great fuel economy and saves a lot of time and work in the boiler room. Ensure that you are friends with your boiler for a long time. What used to be simple becomes harder as you get older. A wood-fired boiler should be swept from the front, not from above or from the side where space is tight or which is awkward to access. The risk then is that sweeping is never carried out. 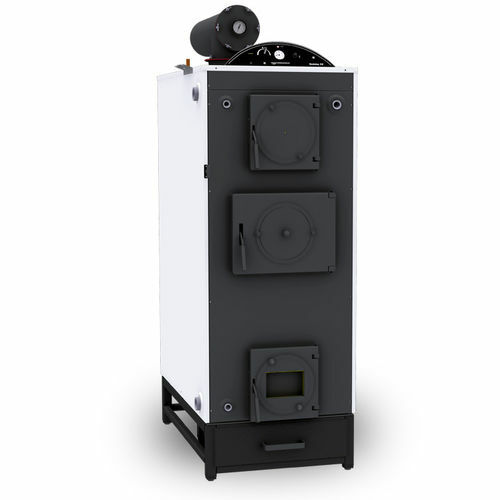 Did you know that you can light your Värmebaronen wood-fired boiler in only a minute or so? The supplied LPG lighter makes lighting quick and therefore also green. Because the boiler get up to full operation so quickly, minimal smoke is produced. Good for the environment and not least for neighbour relations!